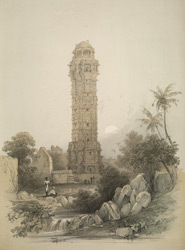 This is plate 11 from James Fergusson's book 'Ancient Architecture in Hindostan'. This picture shows the Vijaya Stambha inside the fort at Chittaurgarh, Rajasthan. It was constructed in 1448 by Rana Kumbha to commemorate his victory over Muhammad Khilji of Malwa eight years earlier. The tower is visible from miles around, spanning nine storeys, with balconies and an internal staircase. Images of Vishnu and other Hindu divinities cover the walls.